It’s been a busy summer in the Kitchen Design Centre showrooms but that doesn’t mean we haven’t found the time to design some exciting, new displays for you. 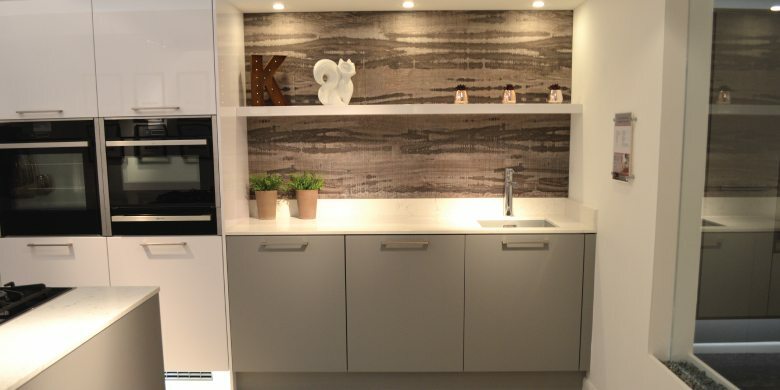 Our newest kitchen design can be found in the Manchester showroom. The brains behind it? Our very own Grace Davids. As one of the newest members of the Manchester team, interior design graduate Grace was excited to get to grips with this on-site project. Known for her ability to make spaces work to their maximum potential, we knew we were going to be in for a show-stopping design from our Grace. Opting for the popular modern German kitchen design, Grace was keen to show exactly what customers could do with their space. She wanted to not only show off the latest products, but also weave in exactly the right elements to create a warm, welcoming and modern space. When it came to the furnishings Grace chose to show off some of the new Hacker doors – which will no doubt go down a storm with our customers. Modern, sleek and sophisticated, they’re ideal for anyone wanting a clutter-free kitchen that’s bang on trend. To complement the doors, Grace included Hacker cabinets in her design, with a colour palette of soft pearl grey and brilliant polar white, while her chosen worktops were the new Cliveden Attico Quartz designs. Other fab furnishings included the new Quadra railing system – the perfect mix of style and practicality and a must in any modern kitchen. The kitchen appliances were similarly stylish – not a surprise really when you consider they’re from Neff. The main cooking appliance installed was the Neff Slide & Hide Oven with warming drawers. Other appliances included the Neff 70:30 freezer and dishwasher, along with the Neff gas hob Faber extractor. To complement the modern and efficient design, Grace opted for one of this season’s hottest colours – grey. Not only did the Hacker doors come in a gorgeous stone colour, the Blanco sink chosen was also in the new colour of pearl grey. Together, these different shades of grey worked together to radiate a modern, natural cosiness. Of course, our designer kitchens wouldn’t be complete without an extra touch of something special. 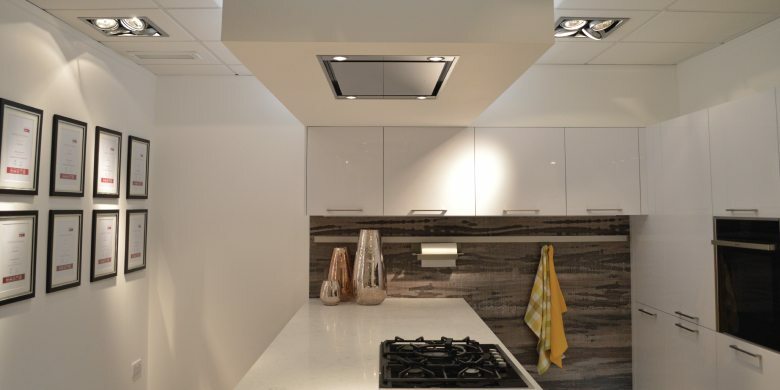 In this design, Grace decided on mood lighting – key for the multi-purpose, multi-functional kitchen, along with built in ceiling detail, which added a sophisticated touch. Want to take a look at the new design for yourself? 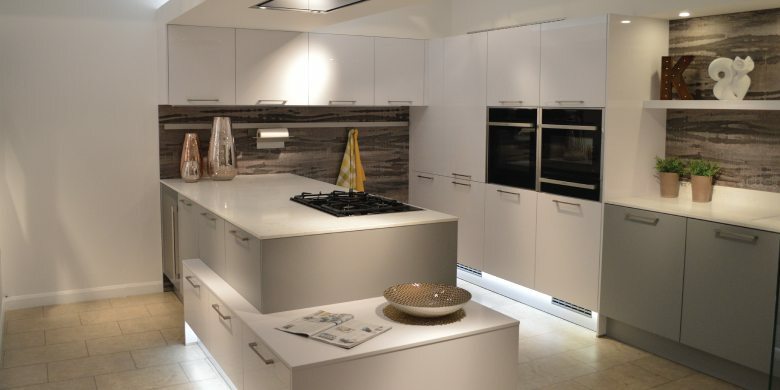 Why not visit the Manchester kitchen showroom today to take a closer look at Grace’s new display? She’ll be more than happy to talk you through all the style elements, appliances and the inspiration behind the design – as well as discuss how the kitchen could be adapted to suit you. ← Add a touch of Scandinavian style!